I'd love to win one of your books! Me too! Count me in. Thanks for being part of the blog hop. Coun me in too for your contest. All your books look awesome! I'm especially thinking I'm going to have to get the Amazon Chronicles, I love shifter books. So many new titles to add to my books to buy list. I need a serious influx of cash to cover them all. 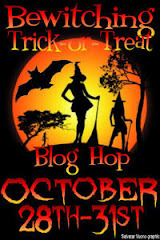 Thanks for participating in the Trick or Treat Blog Hop. It's a blast and the best part is finding new authors to read. Thsnks for the chance to win! Happy Halloween, Sarah! Thanks for the fun! I hope that you had a happy Halloween!